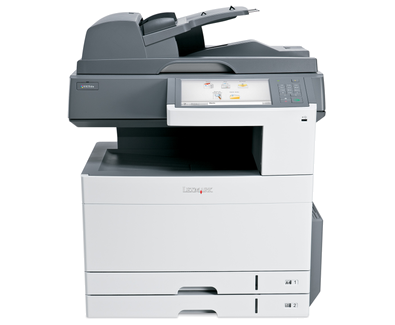 The Lexmark X925de colour MFP delivers affordable A3 and colour functionality for your busy workgroup through easy-to-use features, productivity solutions and a compact design. Scan to multiple destinations, including scan to email, scan to FTP, scan to fax, scan to network and more. Protect your device, data and network with innovative security controls, like authentication and authorisation, and a hard disk with disk wiping and encryption. Save time by scanning both sides of your document with robust colour-scanning capabilities and an input capacity of up to 100 pages. The extra large 10-inch class colour touch screen allows you to operate your printer with ease and confidence through smart and intuitive navigation, easy access to workflow solutions and shortcuts, and the ability to preview your documents and print jobs at the device.